Temple of the Moon at Huayna Picchu – One of Peru’s best-kept secrets? Machu Picchu is arguably one of the greatest archaeological finds of the twentieth century and a must-visit site on most Peru itineraries. 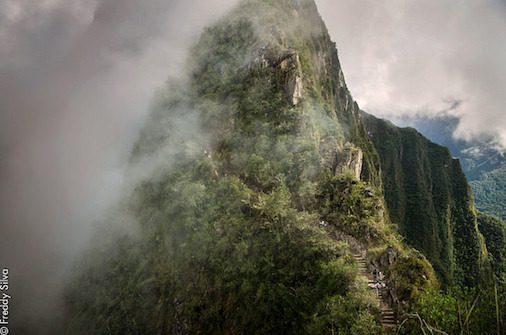 Fewer visitors, however, make the steep ascent up Huayna Picchu, and fewer still venture to the hidden Temple of the Moon. The Temple of the Moon is an ancient Inca temple used by adepts in the final phase of initiation at Machu Picchu. 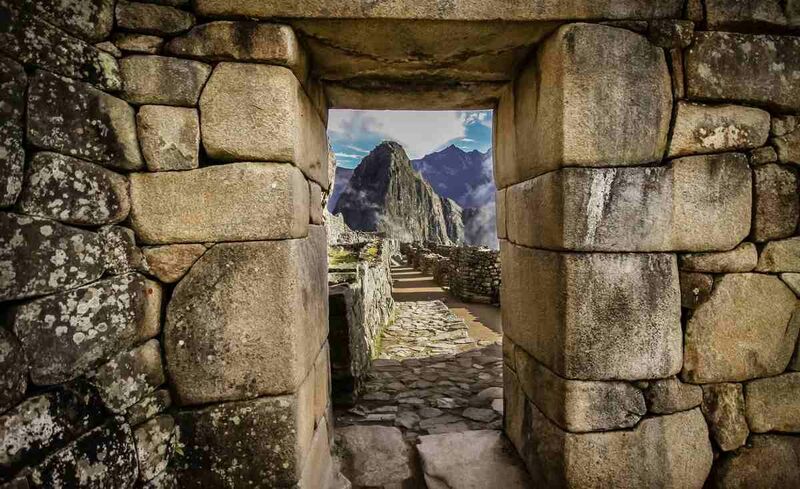 It is built directly into the mountain rock and features “some of the finest stonework in Machu Picchu: classic trapezoidal Inca niches and double-jamb doorways.” There are some good reasons this site remains off the usual tourist “to visit” lists. 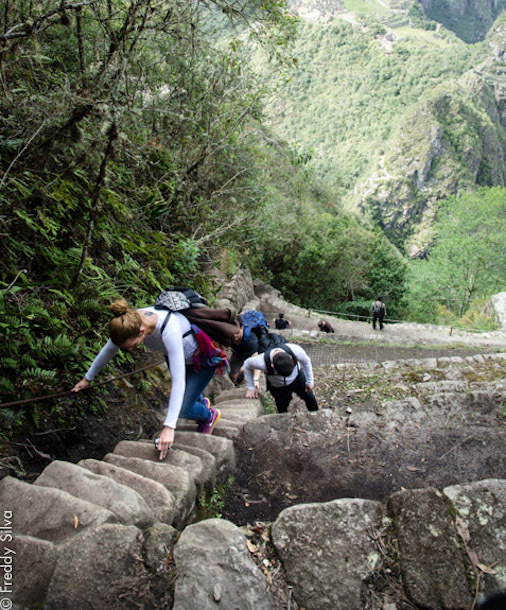 First, the trek to the very top of Huayna Picchu is not the easiest climb – National Geographic, in fact, describes it as a “hair-raising trail”! Second, you need to be an early bird to even make the guest list to be admitted to climb Huayna Picchu! The climb to the top of Huayna Picchu may be hair-raising but the rewards are worth the effort! The views from the top of the summit alone, however, make the trek worthwhile. From here the whole of Machu Picchu reveals itself to you and you can spend a good few contemplative moments breathing in the enormity of what lies below you and feeling a strong connection to an ancient civilization. From the top you can steadily make your way back down and follow the marked trail towards the Temple of the Moon, a natural cave. The “Temple of the Moon itself is a wall of doors and windows sculpted perfectly into the space created by a giant overhanging rock.” (1) Where the Temple of the Sun shines brightly outwards, the Temple of the Moon recedes embracing the darkness. As with many Inca Temples the exact purpose of the Temple of the Moon is still much debated. 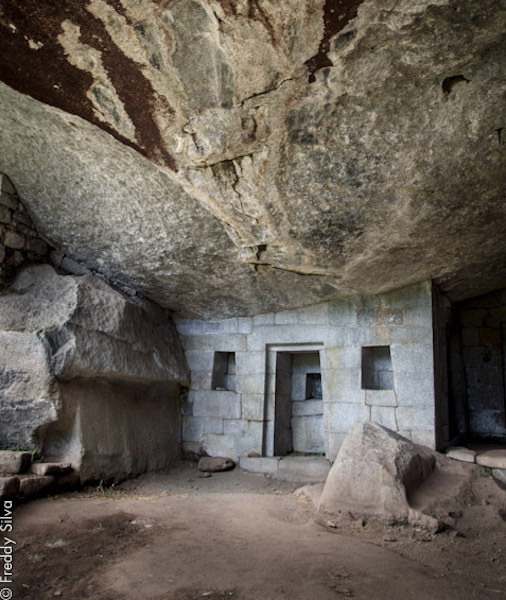 While visiting this ancient ceremonial site you can connect with the powerful energy and draw your own conclusions on its origins. You will also undoubtedly spend some time marvelling at the architectural prowess of the ancients who built such temples. The Temple of the Moon at Huayna Picchu may be one of Peru’s lesser-known sacred sites, but it is certainly one well worth visiting! Inspired to visit this breathtaking site? Join us in November on our journey: Welcome to Portals of Peru with Freddy Silva: Discover the power places of an ancient civilization! This journey is a guaranteed departure with only a few spots remaining – sign up now to guarantee your place and see one of Peru’s best-kept secrets! Sacred Earth Journeys is dedicated to providing a more meaningful and rewarding travel experience, specializing in sacred sites tours and spiritual travel. Our journeys combine respect and reverence for ancient wisdom traditions with the joy of exploring some of the most beautiful landscapes in all the world. Since 2003 we have been offering spiritual journeys around the world, custom sacred tours, and retreats to countries as diverse as Peru, Mexico, India, Ireland, England, Bali, Greece, Turkey, Bhutan, and more.